Love Makes the World Go Round Porcelain Doll by Marie Osmond is a highly collectible doll that comes from a limited edition of 350 pieces. 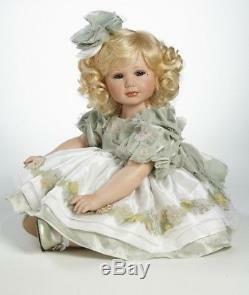 This sitting 17 inch porcelain doll wears a mint green and cream faux silk dress with soft chiffon accents. Sculpted by Marie Osmond for her Musical Moments series as she has a wind-up music box. The item "Marie Osmond Love Makes the World Go Round Porcelain Doll NEW 17LE of 350" is in sale since Monday, November 13, 2017. This item is in the category "Dolls & Bears\Dolls\By Brand, Company, Character\Marie Osmond". The seller is "brenda19purple" and is located in Pflugerville, Texas. This item can be shipped to United States, Canada, United Kingdom, Denmark, Romania, Slovakia, Bulgaria, Czech republic, Finland, Hungary, Latvia, Lithuania, Malta, Estonia, Australia, Greece, Portugal, Cyprus, Slovenia, Japan, China, Sweden, South Korea, Indonesia, Taiwan, South africa, Thailand, Belgium, France, Hong Kong, Ireland, Netherlands, Poland, Spain, Italy, Germany, Austria, Russian federation, Israel, Mexico, New Zealand, Philippines, Singapore, Switzerland, Norway, Saudi arabia, Ukraine, United arab emirates, Qatar, Kuwait, Bahrain, Croatia, Malaysia, Brazil, Chile, Colombia, Costa rica, Panama, Trinidad and tobago, Guatemala, Honduras, Jamaica, Antigua and barbuda, Aruba, Belize, Dominica, Grenada, Saint kitts and nevis, Saint lucia, Montserrat, Turks and caicos islands, Barbados, Bangladesh, Bermuda, Brunei darussalam, Bolivia, Ecuador, Egypt, French guiana, Guernsey, Gibraltar, Guadeloupe, Iceland, Jersey, Jordan, Cambodia, Cayman islands, Liechtenstein, Sri lanka, Luxembourg, Monaco, Macao, Martinique, Maldives, Nicaragua, Oman, Peru, Pakistan, Paraguay, Reunion.